Before the Reformation, Lowestoft's Catholic priests ministered the sacraments at the church of St Margaret, on a hill to the west of the modern town. That, of course, is now in the care of the Church of England, and the Anglicans also have a number of other 19th and 20th century churches around the town. 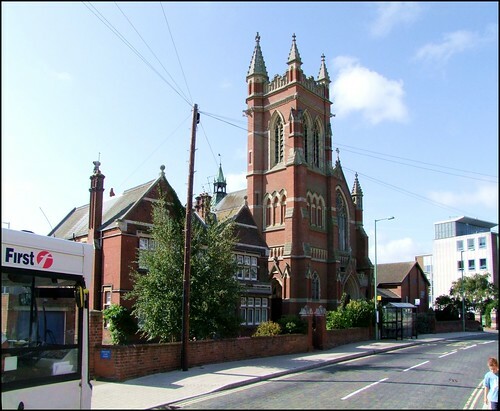 But there is only one parish church directly in Lowestoft town centre, and that is the Catholic church of Our Lady, Star of the Sea, giving this building a special place in the urban landscape. It is also the most easterly Catholic parish church in the entire British Isles. The dedication, Stella Maris in Latin, would have been more common before the Reformation; it was probably the original dedication of Ipswich St Mary at Quay. Our lady is a magnificent late 19th century essay in Early English cathedral architecture, and quite the grandest Catholic church in Suffolk, Beccles and Bungay not excepted. Its setting puts me in mind more of France than England, with the bus station beside it and its apsed east end sticking out into the open market of the Benjamin Britten shopping centre. The red brick and white stone build together, a sanctus bell turret rises from the spine, to articulate something rather more sophisticated than any of the other 19th century churches in Lowestoft. The church was the work of Baines and Richards, and the foundation stone was laid in August 1900. The parish had been served by missionary Priests from the Jesuit community at Yarmouth, just over the Norfolk border, from about 1850 onwards, and the community met in an upstairs chapel in the now demolished Denes area. The first Mass here was on June 5th 1902. The western entrance to the nave sits to the right of the tower. You step into a porch area, and modern glass doors lead into the body of the church. The interior is decorated beautifully in a restrained Arts and Crafts manner; although, having seen an early postcard of the interior, I think that the ceiling and wall murals are probably a little later than the building itself. On entering, all eyes are drawn to the sanctuary. With an apse behind, the altar sits in a central position, with the high altar and reredos beyond it. Above, a clerestory is filled with Kempe glass, and above that the apse roof is painted with Christ in majesty surrounded by the disciples. Around the church are large carved stations in the Arts and Crafts manner, and there are other devotional objects, including a 19th Century seven sacrament font, a pieta, an image of Our Lady of Boulogne, and a large wooden cross which may have come from a rood, although I understand that this church never had one. The mural paintings of More and Fisher are fine, as is the painting of Mary at the foot of the cross in the Lady Chapel, where there is also an icon of Our Lady of Pity. Perhaps most beautiful of all is the screenwork between chapels and sanctuary.All around, on roofs, walls and floor, are examples of the care and love lavished on this building over the last century. In so doing, the people here have imbued it with a sense of continuity as well. This beautiful church has a chapel of ease at Pakefield St Nicholas, on the other side of the river, a sign of the busy life of this parish. Our Lady is a credit to its parish, and a blessing to the people of Lowestoft.